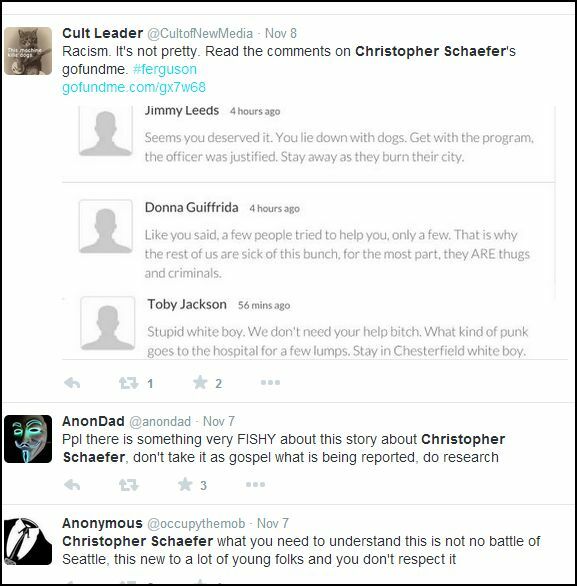 Chris Schaefer - "Beat Up"
White Boy Bleed Alot – White Student Goes To Support Mike Brown Protestors, Attacked By Mob…. FERGUSON, Mo. - An UMSL student who's been involved in the Ferguson, Missouri, protests says he was beat up after a meeting last night. Now, the clergy that organized that meeting are apologizing for what happened. There were to be no recording devices at the protest strategy meeting Thursday night. About 40 minutes into the meeting, someone pointed out that a young man, who has been live streaming from the protests, had his cell phone and camera out. Several people reportedly attacked him. The 23-year-old student, Chris Schaefer, says he was punched in the head, and kicked in the ribs and stomach. He suffered scrapes and bruises, and says he knows those injuries could have been much worse. "I thought, 'This could be it, I might die,'" Schaefer said. Schaefer said he thought that after a group of five or six people pushed him out of the meeting at the Greater St. Mark Family Church, and then pushed him to the ground. Before it could any worse, another group rushed out from inside the meeting and formed a barrier for Schaefer, then told to him to run. "I was really exhausted, I couldn't breathe. At this point I was running for my life," Schaefer said. What Schaefer says he never posted was video from the meeting because he says he never recorded any. Friday night, community leaders who helped organize Thursday's meeting publicly apologized, saying the actions of a few don't match the mindset of the many. "This is not who we are. Our community deals with behavior and makes sure we uphold our standards," Pastor Derrick Robinson said. "We can't ask to hold the police accountable, but yet we can't hold ourselves accountable. It doesn't work like that," said Ferguson Committeewoman, Patricia Bynes. Bringing accountability to the situation, is what Schaefer says brought him to Ferguson in the first place. But, he says he likely won't be back. "For me, I don't think I could do it again," Schaefer said. None of Schaefer's injuries were serious. But, he says he was slapped with a $2,200 hospital bill. St. Louis County Police are investigating the incident and say they're actively searching for five to six suspects. A few gofundme messages that were posted under the original account, found on twitter. ST. LOUIS COUNTY • Four Ferguson protesters were charged Thursday in connection with an attack of a man they accused of sending out unauthorized video at a protest strategy session. The four, all members of the Lost Voices protest group, were each charged with one count of second-degree robbery. They are: Allen Anthony Frazier Jr., 27; Melissa C. McKinnies-Sanders, 39; Brandi Shields, 17; and Lynard A. Smith, 33. Police are trying to identify a fifth suspect. The victim told police he was dragged outside of a church by five or six men and beaten on Nov. 6. Ferguson protesters were having a strategy meeting at the church. The four are accused of taking the man's iPhone and iPhone charger. The victim, Chris Schaefer, even did a live stream video from the hospital, showing a bloodied hand. One of the people charged, McKinnies-Sanders, told the Post-Dispatch on Thursday that she didn't attack Schaefer or take his phone. She says she actually intervened when others were attacking him, and returned his phone later after finding it on the ground. "Wow," McKinnies-Sanders said when she heard the charges in a phone interview. "That wasn't me. Nine or 10 people ran out of the church after him and I wasn't one of them. This fighting and all of that, it's not what I came for." The other suspects could not immediately be reached for comment. St. Louis County Police Officer Shawn McGuire said the crime of second-degree robbery includes the element of an assault on the victim. It is a felony punishable by up to 15 years in prison. Investigators believe the robbers' purpose was to take the phone away and that the assault ended once they got the phone, McGuire said. Schaefer was robbed at the Greater St. Mark Missionary Church in unincorporated north St. Louis County. The church is at 9950 Glen Owen Drive. Schaefer, 22, of St. Louis, said he is graduating this month with a business degree from UMSL. He said he attended the protest planning session at the church for three reasons: he was interested in the movement, he considers himself a protester too, and he wanted to document the movement as an independent journalist. The protesters were coming up with strategy as they awaited the grand jury’s ruling on whether police Officer Darren Wilson would face criminal charges in the fatal shooting of Michael Brown. Wilson was not indicted. He said he was was attacked after being accused of using his phone to stream the meeting to the Internet, but he said he wasn't doing that. He said about five people rushed him, pushed him out the door and ripped the phone from his hands. He was hit, and after falling to the ground, was punched and kicked. Schaefer said wonders if he was targeted because he is white. He says he was one of a small number of white people at the church for the meeting. "Maybe they really thought I was a police officer or an informant," he said. He said the attack left him bruised and bloodied. His medical bills totalled $3,166, he said. Police said the victim and a witness had identified each of the four suspects. All are from north St. Louis County. Smith lives in the 1800 block of Ferguson Avenue in Pagedale. Shields lives in the 2500 block of Switzer Avenue in Jennings; McKinnies-Sanders lives in the 1300 block of Coppergate Lane in unincorporated north St. Louis County; and Frazier lives in the 6700 block of Bitteroot Lane in Berkeley. McKinnies-Sanders said she is one of the founding members of Lost Voices. She was among those who slept in tents for weeks along West Florissant Avenue after Brown was fatally shot on Aug. 9. McKinnies-Sanders said she believes she and her three co-defendants are being unfairly targeted by police. "We're being targeted because we're the ones out here with Lost Voices pushing this movement," she said. When she was interviewed, she was at home and had not yet been arrested. She said she expected police to come for her at any time. Smith spoke to the Post-Dispatch in November using the pseudonym "Bud Cuzz" and said he was affiliated with Lost Voices, but said he didn't see anyone get beaten up. He said Schaefer had been told at the start of the meeting that no cameras, pictures or recordings were allowed. He said Schaefer should have followed directions. Mug shots of several of the suspects were not immediately available. Despite his experiences, Schaefer said he went back to the protest lines two nights after the announcement there would be no indictment of Wilson. He went to the Ferguson police station and videotaped the crowd, the police and the police response. He said he also attended a die-in at UMSL but did not get on the ground. Schaefer said protesters should be held accountable if they do something wrong. "You can be a supporter of a movement and still call out people doing wrong," he said. Paul Hampel of the Post-Dispatch contributed to this report. Kim Bell covers breaking news for the Post-Dispatch and STLtoday.com. Follow her on Twitter here. Subject: Re: Chris Schaefer - "Beat Up"